Create n Carve ~Fruit and Vegetable Event Annoucement!!! This month I am hosting Create n Carve event started by Nayna of Simplysensational Food who has wonderful recipes at her space. I would like to thank Nayna for giving the opportunity for hosting the event. Inviting you all to participate in the event with your entries. Are you creative? Do check out the tutorial link to start with carvings click here. 1. Any number of fresh entries can be sent. Archived entries to be reposted, else will not be accepted. 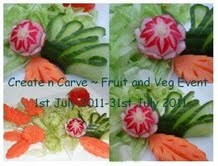 You can create n Carve Fruit and Vegetable from now till 31st July 2011. Using fruit or vegetable show a garnish or carving you have created . You can post instructions on how to create your garnish / carving although it is not compulsary. If you use an on line source or video to help you , please do not forget to link the source due to copyright reasons and of course to give full credit to the owner. You can use cookie cutters, knives, fancy garnish cutters, graters any tool to help you create your piece of art.You may send entries where you have used your garnish or carving on a cooked dish but remember the main emphasis should be to show the carving /creation. 2. Use of logo is compulsory. 3. The entry should be linked back to this event announcement and Nayna Events Page. 5. Non bloggers can also participate, by sending their entries by email to simplysara07@gmail.com with photograph. 6. Roundup will be posted in August. So start carving and creating. Looking forward for your creations. Hey saras.. grt event. Happy Hosting. Nice event.. Happy hosting dear !! Thanks Sara for hosting this event. Happy hosting. This is a wonderful and creative event. Event has been announced in food blog news!!!! you can view now!!!! !thnx for informing!!! !